Peaches bring out the poet in people. Rebecca Torosian of Tory Farms describes her favorite peach, the Diamond Princess, this way: “it’s a drip-down-your-chin, lean-over-the-sink, eat-that-peach-when-it’s-dead-ripe kind of peach.” At the height of summer, peaches have an intoxicating aroma and an almost too-good-to-be-real flavor—it’s no wonder some shoppers make the trip to the farmers market just for them. What makes farmers market peaches so much juicier, sweeter, and peachier than grocery store peaches? What kind of magic creates that perfect-tasting peach? Some growers won’t reveal their secrets, but most agree that it starts with a good variety. According to Rebecca Torosian, each peach has its own personality, and each taster has a different idea of what’s tastiest. Some people prefer the pure, low-acid sugariness of a white peach, while others live for the tart/sweet flavor of a classic yellow peach. There are a few old-fashioned varieties that everyone agrees are great—Steven Kashiwase of Kashiwase Farms likes the O’Henry because of its nice balance between acid and sugars. But delicious new varieties are emerging all the time: over 2000 varieties exist and more being created all the time. The sweetness of a peach also depends on how ripe it was when harvested. “It’s important to pick peaches at the peak of ripeness,” says Ted Loewen of Blossom Bluff Orchards. A peach will get juicier and softer as it ripens on a kitchen counter, but it will have only the amount of sugar it started with when it was picked. What changes is the chemistry; the acid content decreases as the fruit ripens, and so the fruit tastes sweeter. 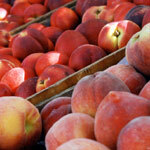 In the grocery store distribution system, peaches are often picked early, before sugars are able to fully develop. A peach picked while still firm can better withstand long-distance shipping. Peaches imported from the Southern Hemisphere (such as those that appear in stores in the winter) can be in cold storage for four to six weeks. Ted cites studies that show that after a certain period of time in refrigeration, a phenomenon called internal breakdown occurs in peaches. They get dry and mealy, or hard and leathery, or they can brown on the inside. These symptoms emerge during ripening after cold storage and usually aren’t detected until a consumer takes a very disappointing bite. Growing practices can affect the flavor of the fruit, too. Both Ted Loewen and Victor Martino feel that too much irrigation at the time of fruit maturity results in a bland peach. Ted also notes that it’s important to supply adequate nutrition during the whole life of the tree, rather than “pumping up” the soil with fertilizer during fruiting time, as some conventional growers do. Steven Kashiwase uses composted chicken and cow manure from a nearby farm, and supplements it with liquid fish fertilizer. Tory Torosian of Tory Farms uses little fertilizer—just a light application of composted manure—but instead focuses on retaining nutrients on his land. He incorporates weeds back into the soil, and he shreds up the wood he prunes from his trees and uses it as mulch. Next time you bite into a fresh, tree-ripened peach, take a moment to reflect on how lucky we are. California’s climate, especially in the Central Valley and the Sierra foothills of Northern California, is ideal for peaches; in fact, this state is the nation’s largest producer. Also worth appreciating are the many individuals who help bring peaches to the market: the pruning, picking, and packing of this delicate fruit is done by hand.